Right click menu of Internet Explorer browser can become cluttered over a period of time. As new software are installed, few may add their item entry into right click menu of Internet explorer. Fortunately, you can easily edit and clean up right click menu of IE by making registry changes. 1. Open Registry Editor. Goto start > Run and type regedit (On Windows 7 directly type regedit in search bar to open registry editor). You can backup registry for easy restoration in case of wrong editing. Ideally, making changes in registry editor are not recommended, use discretion. 3. MenuExt will have folders for items in IE’s right click menu. There will a separate folder for each item in right click menu of Internet Explorer. Right click on specific folder under MenuExt to delete that item. 4. 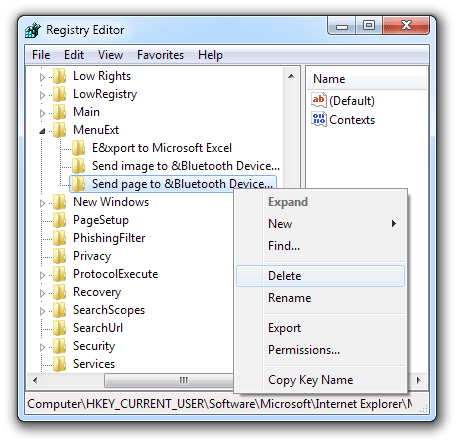 Once required items are deleted, close Registry Editor and restart Internet Explorer. Deleted items should not visible in right click menu of Internet Explorer. For example, in above screenshot there are 3 additional items in IE’s right click menu. It includes: “Export to Microsoft Excel”, “Send image to bluetooth device” and “Send page to bluetooth device”. You can only delete these items from the right click menu of Internet Explorer.